It's always a scary time when you realise your child isn't developing at the same rate as the children of other parents you know. Sometimes it's obvious, other times it's just a suspicion, a feeling that you can't quite put your finger on - and although there's lots of information available on the interweb, you may not be sure which you can trust. But now Contact a Family, the charity that helps families with disabled children, has published a free, practical guide to help. The booklet, Developmental Delay, includes a useful pull-out poster to help parents recognise key skills developed by most children between birth and five years of age. The guide highlights the importance of getting support as soon as possible for your child’s development, without waiting for a diagnosis. Contact-A-Family has a series of guides called "About Diagnosis" which also includes Living with a rare condition and Living without a diagnosis, which you will know if you are a regular reader, are issues we often talk about here at Special Needs Jungle. Our brilliant, but delayed, columnist Renata still does not have a diagnosis for little Dominic, Debs' son J lives with the extremely rare condition Retinopathy of Prematurity and of course, my younger son has Ehlers Danlos Syndrome & Postural Orthostatic Tachycardia, as do I. While we're talking about rare diseases, don't forget we're supporting Rare Disease Day, coming up at the end of the month. We'll be having a number of posts featuring rare diseases and a special post on Rare Disease Day itself . At the end of this post I'm adding an incredibly easy way that you can support Rare Disease Day too, that takes about 30 seconds, if that. The new Contact A Family guide offers trusted help to families beginning to realise their child has a difference in his or her development, which for all parents affected, whatever kind of condition, is the first step on a very long, arduous and often heart-breaking road. Just thinking about the start of our own journey years ago, and my worries that were dismissed by family and professionals alike as the silly fears of an over-anxious mother, still makes me emotional today, a decade on. The problem is, when it isn't immediately obvious, it can be subtle and parents don't want to be thought of as imagining things because children do develop at different speeds. Anne Brooke, Head of Advice and Information at Contact a Family says, “There can be many reasons why a child takes longer than other children in their development, for example learning to walk, communicate, show affection, and play with others. This can sometimes be the first sign that a child has a long term medical condition, such as a learning disability, autism or rare genetic condition. Doctors might have to wait until a child is older and their symptoms more marked before they can make a firm diagnosis. 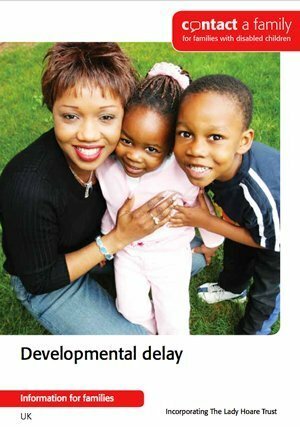 In this situation, parents will often be told that their child has developmental delay - or global developmental delay if the child’s is slow in developing skills in more than one area. These guides can be used by parents and medical professionals equally. Let's face it, it's not unusual for a GP to be unfamiliar or sceptical when seeing a rare condition or one they've never come across. It should also help them be able to empathise more with the concerns of a worried parent, so why not get one for your doctor's surgery too? Parents can request a free hard copy of any of the guides by calling freephone 0808 808 3555 or visit www.cafamily.org.uk for more information. Now to the Rare Disease Day appeal. You never know when your life is going to be touched by the shadow of illness; I know that only too well. When the condition is rare, there is so much less chance that there is a proven treatment to help or even that it will be recognised immediately for what it is. Why not spend under a minute to support this year's campaign? Visit Thunderclap, where the Rare Disease Day originators, EURORDIS have a campaign to get as many people as possible to pledge a single social media message supporting their awareness day. Just click the link, or the button below, choose to use your Facebook, Twitter or Tumblr account to echo and therefore amplify the campaign's message... and you're done! Why would you not want to? The message won't go out unless they attract 500 people to back the campaign. That may not sound a lot but to get people to bother to take less than one minute to help is not that easy! Learn to read for free! Thanks for spreading the word and helping parents with special needs children.